Timbuktu rejects al-Qaeda: Timbuktu residents are determined to stop them. Al-Qaeda in the Islamic Maghreb (AQIM) and Ansar al-Din are not receiving a warm welcome in Azawad. Days after Touareg rebel Iyad Ag Ghaly's Islamist group seized Timbuktu with the help of al-Qaeda, residents struck their first blow against what they called the "Islamic and foreign groups in the region" by staging a protest on Friday (April 20th). "Elements of al-Qaeda and Ansar al-Din tried to stop the march, but young people ignored them," an official of the Belferandi mosque told Magharebia. Northern Mali's strong cultural pride, Touareg heritage, affinity for Sufism and respect for women's freedom make them deaf to the extremists' message. They are vocal about their refusal to let their UNESCO World Heritage Site be held hostage by Islamic hardliners. "We held our own banners to show our rejection of al-Qaeda and the carriers of black flags [Salafists]," Elhassan Cissé, a bus driver in Timbuktu, tells Magharebia. "The people who took part in the march were very angry with the behaviour of al-Qaeda and Ansar al-Din because they enter people's houses, break their belongings and intervene in the details of their lives," he adds. Local imam Daoud Ibn Mohammed explains that Timbuktu residents sought to do more with their rally that condemn the presence of extremists and denounce the new al-Qaeda affiliated wali. "They also wanted to protest against the behaviour of the new leaders," the imam says. "The way they run our lives led to acute food shortages and the spread of hunger and poverty among the people." Extremist groups have allied to control the Azawad region as a prelude to controlling all of Mali, analyst al-Mokhtar al-Salem warns. But that will prove impossible in a region where the values of openness and tolerance prevail, he adds. "Women, for example, move around without veils and enjoy much freedom in management and leadership," al-Salem says. "It would be difficult to apply strict Islamic laws in a society that has habits and traditions which run against repression and restriction." Mali is much different than places where al-Qaeda gained a foothold, such as Afghanistan, he points out. "Afghan society is controlled by traditions that don't give women any right to express their desires, and therefore, it constituted a suitable ground for the infiltration of al-Qaeda ideology," Al-Salem says. 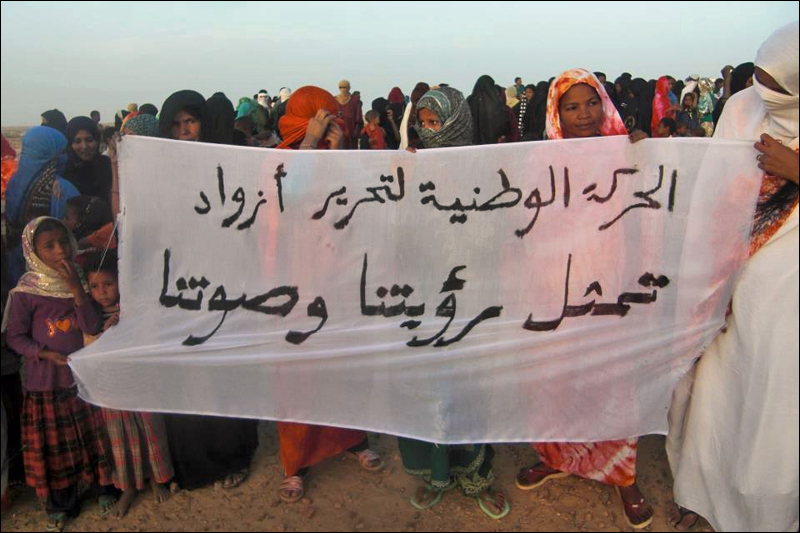 Another factor that leads Azawad residents to reject al-Qaeda is their pride in their patrimony. For centuries, the area has been a crossroads of religion and culture known for its tolerance. Residents were outraged when gangs recently raided symbols of Christianity in Gao, Kidal and Timbuktu and looted the cities' cultural landmarks, such as Timbuktu's Ahmed Baba Institute of Higher Islamic Studies and Research (IHERI-AB). Sufism, which stresses mysticism and moderation, is also popular in the region. "The spread of Sufi ideology among Timbuktu residents is one of the reasons that made them reject extremist ideology, because al-Qaeda usually accuses those who embrace Sufism of kufr," said Mubarak Ag Mohamed, a member of the media office in the National Movement for the Liberation of Azawad (MNLA). Abdel Hamid al-Ansari, an analyst and academic in Timbuktu, complains that "Ansar al-Din and their al-Qaeda allies have disfigured the bright image of religion". "Applying Islamic Sharia has only brought poverty, hunger and devastation to Timbuktu and aggravated people's sense of injustice, repression of individual and collective freedoms, prompting them to take to streets to condemn it," al-Ansari says. This public outcry arose as soon as the terrorists "said they would raid shops, force women to wear the veil, and impose religious education", he tells Magharebia. "These practices are not acceptable in this city, which carried the banner of real Islam in the region." If the terrorists are still determined to control the region, even in the face of this public rejection, they will be hard pressed to supply, electricity, water and food, he notes. They are not prepared to do the job of the Malian government. Sid Ahmed Ould Tfeil, an analyst of Salafist groups, is not surprised that Azawad rejected the extremists. For starters, the Malians suddenly found themselves under the control of a foreigner. As part of their deal with AQIM, Ansar al-Din appointed Algerian national and al-Qaeda emir Yahya Abou al-Hammam (real name Jemal Oukacha) as the local governor. He was named wali of Timbuktu because he had spent years in the region, "but he was not accepted by the predominantly Arab and Touareg local residents", the analyst says. "Those who know the tribal, religious and doctrinal nature of Azawad society in general and Touaregs in particular will realise that it's not easy for them to accept the control of any outsider force, especially from al-Qaeda," Ould Tfeil adds. It was not long before local residents "started to understand the danger that group poses to their political independence future and sovereignty," he says. "And although al-Qaeda was able to create a few alliances with tribal chiefs due to the absence and weakness of Mali's central government, this alliance is no longer possible under the current circumstances," he tells Magharebia. "Most people in Azawad society have ambitions of obtaining independence, living in an atmosphere of stability and security and forming relations on an international level. Therefore, it is natural that they reject al-Qaeda, and this explains why Timbuktu residents reject Abou Al-Hammam's leadership," Ould Tfeil says. Ham Ag Mahmoud, a member of the MNLA's political office says, "We alone have the right to appoint a wali in town, not al-Qaeda and not Ansar al-Din." The Timbuktu march last Friday "was the peak of rejection, as the residents could no longer accept the reality which was imposed on them", the MNLA official tells Magharebia. Mouhi Ag Boulkhei, a MNLA military officer in Niafounké, southwest of Timbuktu, agrees that local residents would feel compelled to demonstrate against a wali imposed on them by outside groups. "What do Ansar al-Din and al-Qaeda mean?" he asks. "What benefit can they bring to the people? We've already warned them to leave our land because we won't be governed by people who don't belong to us." Picture: Timbuktu residents rally against control by Islamist group Ansar al-Din. Photo: Jemal Oumar.